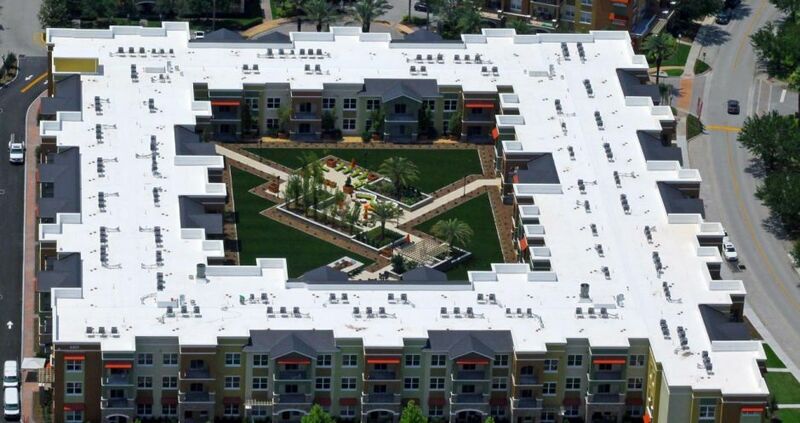 Tecta America Southeast – Sanford, FL was awarded second place for delivering a well-appointed, centrally located courtyard at the Urbana @Hunter’s Creek apartment complex in Orlando. In this day and age, the term “luxury apartments” is everywhere. It’s not until you come across a complex like Urbana @Hunter’s Creek does that depiction really resonate. Swaying palm trees and brightly hued buildings welcome you to Urbana as these apartments deliver unparalleled luxury. The centerpiece of this facility is its well-appointed, centrally located courtyard, which includes spacious artificial urn areas for play, an outdoor kitchen and plenty of space to relax. It’s also used for nighttime lounging and entertainment. Tecta America Southeast – Sanford was responsible for this lavish 32,500 -square foot part of the facility, installing 60 mil Sarnafil G 476 Self Adhered waterproofing membrane to create the space. A major obstacle during the installation was the central courtyard, which made reaching it via crane impossible. A decision was made to cut a hole in the second floor of the building and create a corridor in order to load the materials. The end result of Tecta’s hard work is a truly luxurious courtyard where Urbana’s residents can bask in a momentary escape from the stresses of the real world.